The fundamental building blocks of matter are buried deep within the atom. The protons and neutrons, which compose the atom's nucleus, are themselves complex. They have a rich substructure consisting of electrically charged quarks and uncharged gluons. These inner building blocks combine to form the proton’s overall characteristics. When the protons from the LHC collide, they sometimes produce W and Z bosons, the massive carriers of the weak force responsible for radioactive decays. Hence, the proton substructure may be probed by measuring the characteristics of the production of these bosons. These bosons are produced in abundance at the LHC and ATLAS physicists have now precisely measured their production rates using 13 TeV proton-proton collision data recorded in 2015. The W and Z bosons themselves only exist for a very short time at the centre of the proton-proton collision point. Their decays often involve leptons such as electrons, heavier muons and nearly massless neutrinos. These decay products are however very cleanly detected by the ATLAS experiment. Although other physics processes will also produce these particles, careful comparison of the data with expectations allows physicists to subtract these undesirable contributions. Results from the W and Z boson decays into electrons and muons were carefully scrutinised and then combined to increase the overall precision of the measurements. Because the W and Z bosons are primarily produced by quark interactions within colliding protons, their measurement can be considered a direct probe of the proton’s quark content. 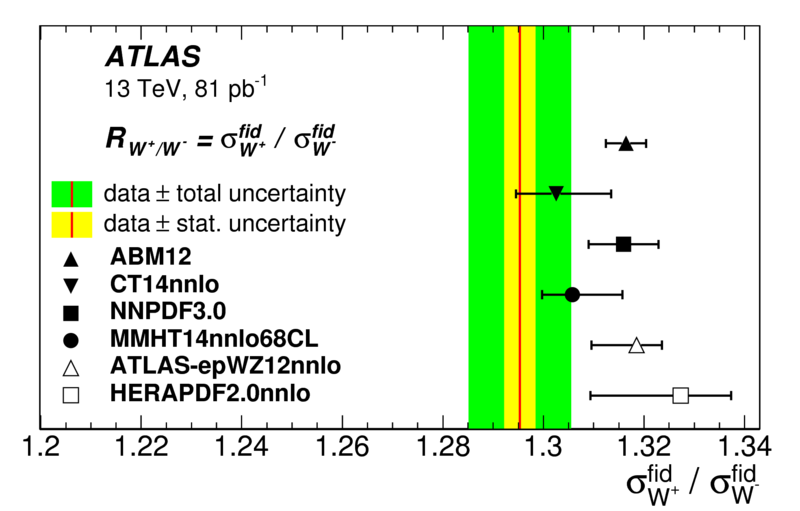 The ATLAS measurements have been compared to theoretical predictions, each hypothesising different proportions of quark and gluon content in the proton (see Figure 1). The ratio of two cross sections can benefit from the cancellation of many experimental uncertainties common to both measurements. Using this technique, the ratio of the W+ and W- boson production rates has revealed the relative contributions of two flavours of quarks – up and down – to a precision of better than 1% (see Figure 2)! Such measurements will contribute significantly to the understanding of the large 13 TeV dataset expected in the coming years.